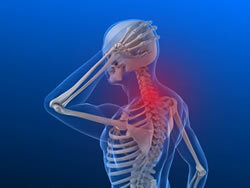 You may be suffering with neck pain and wonder whether or not all neck pain is the same. It’s not. Headache – This may take place because the meningeal lining of the brain has been irritated or due to trigger points within the muscles that refer pain in the head. Impinged nerves in the neck can also cause cervicogenic headache. Stiffness – Stiffness indicates that the muscles are trying to prevent movement so that no extra damage will take place to the fundamental structures of the cervical spine. Poor range of motion – Not being able to move your head to the left or right or to your shoulder is one of the causes of neck pain. This sign indicates that there is scar tissue or misaligned vertebrae in your neck. Eye pain or vision problems – This symptom implies that injury to your neck is more than just muscle strain or a sprain. Fatigue – Fatigue is another symptom that can indicate more serious health problems if it's combined with neck pain. Your Arlington, WA chiropractor, Dr. Ernst, can help get to the root of your neck pain. If you live in Arlington, WA, call us for a consultation today at (360) 659-8464!